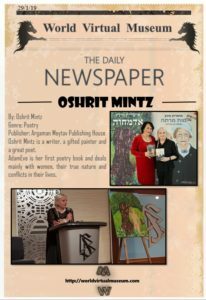 Oshrit Mintz is a writer, a gifted painter and a great poet. AdamEve is her first poetry book and deals mainly with women, their true nature and conflicts in their lives. 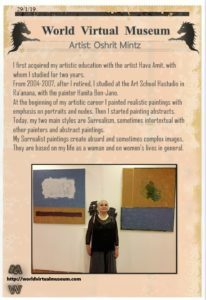 I first acquired my artistic education with the artist Hava Amit, with whom I studied for two years. 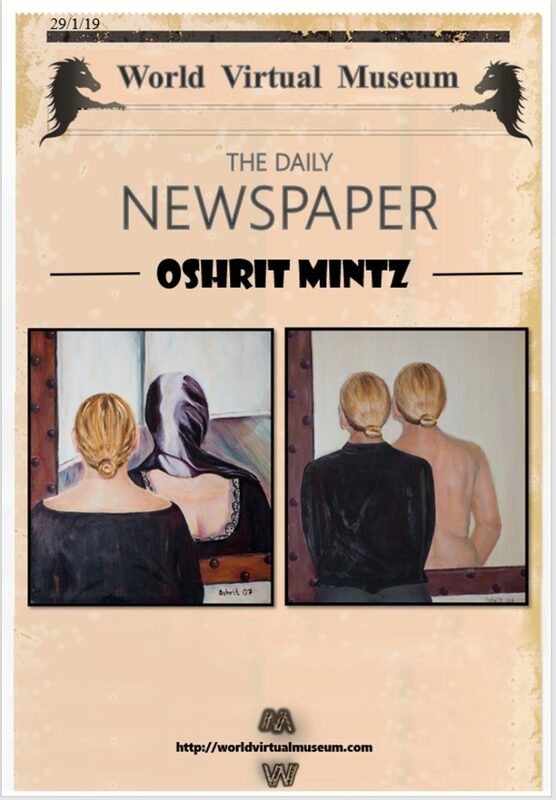 From 2004-2007, after I retired, I studied at the Art School Hastudio in Ra’anana, with the painter Hanita Ben-Jano. At the beginning of my artistic career I painted realistic paintings with emphasis on portraits and nudes. Then I started painting abstracts. Today, my two main styles are Surrealism, sometimes intertextual with other painters and abstract paintings. 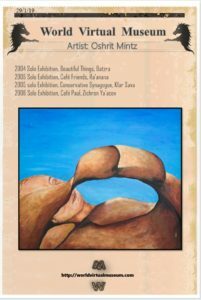 My Surrealist paintings create absurd and sometimes complex images. They are based on my life as a woman and on women’s lives in general. The paintings’ style is realistic, but the absurd images give it a strong emotional impact. In many of the paintings I use my body as an art object, sometimes combines with primordial landscapes. In my abstract paintings, I use massive quantities 0f oil paint, layer upon layer. The mass of colorful paint expresses intense emotion, while the minimalistic form gives a frame to that emotion. It seems to me that this is a fairly accurate description of my world and what I am trying to convey in painting: the polarization between intense emotion and restrictive framework. In these paintings I feel the greatest connection to my inner self. 2018 (November) Group Exhibition ‘Emotions and Beyond’ Ringstrasse Galerin, Vienna. 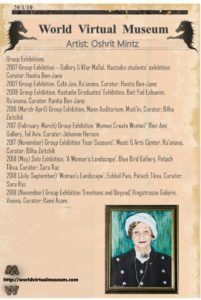 Curator: Rami Azam.